This is a study of the multiple drawing processes used by the Epigraphic Survey (Chicago House) to document a pillar scene of Thutmose III Given Life by Amun-Re on the façade of the Small Amun Temple at Medinet Habu in Luxor. The scene, identified as MHB 122, is located at the northeast side of the temple and is almost completely obscured by a later wall dating to the Ptolemaic period; all that is visible is the vertical decorative border on the left. The narrow gap between the wall and the pillar varies from 4-6cm wide, making it not possible to photograph or draw using the usual Chicago House method of photographing the scene and penciling on a photo enlargement. 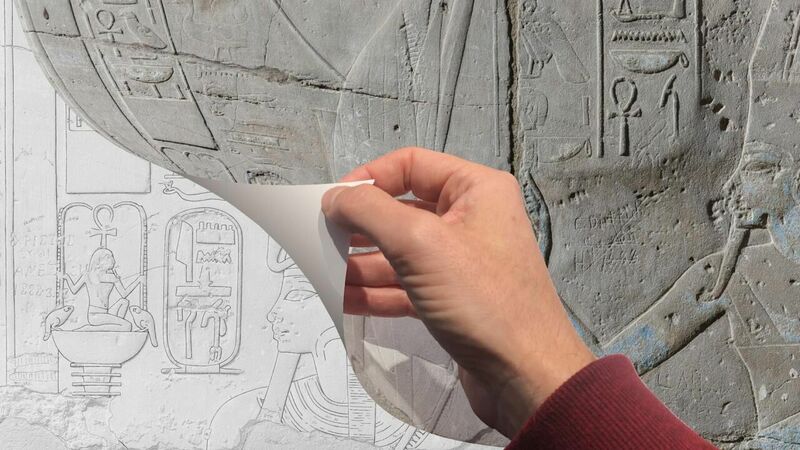 However, it was just wide enough to be able to recreate most of the scene, inscriptions, and architectural features by doing foil rubbings. In 2004, together with artist Will Schenck, we began the documentation by taking as many measurements of the pillar as possible and transferring these onto a sheet of plastic to create an accurate 1:1 outline on which to place any information we could collect of the scene. By carefully using a long stick tipped with wadded cotton and rubbing this against aluminum foil positioned over the carving, we were able to take many small rubbings of the carved sunk relief, piece them together, place them underneath the marked-up sheet of plastic to create−as close as we could get−a facsimile of the scene. This drawing on plastic was photographed with a large format camera by Yarko Kobylecky, reduced to match the 1:4 façade scale, and printed out. From this point on I used our traditional method to ink on the photographic paper using specified sizes of Rapid-o-graph pens to represent our conventions for sun and shadow lines, damage, trace, plaster, dotted paint lines, and larger architectural lines. The epigraphers, Jennifer Kimpton and Brett McClain blueprinted my inked drawing and began the rigorous collation process at the wall using foiling to study the scene and gather information to answer any questions that came up. I then double-checked their suggested edits, we agreed on the necessary changes, the drawing was adjusted, and the epigraphers approved the final changes. It was ready for a final check on site by the director and then could be prepared for future publication. In the meantime, the West Bank Ground Water Mitigation Project conducted by USAID was completed in 2011. 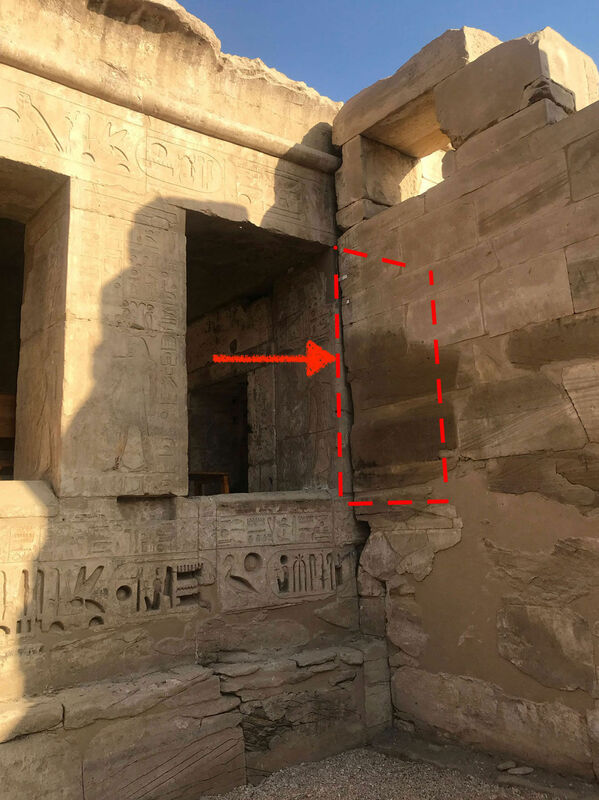 By 2012, with the ground water obviously lowered, there was noticeably less moisture in the stone foundations of the three temples within the Medinet Habu Temple complex and the water level in the sacred lake to the north had lowered by approximately 3 meters. By chance, I also noticed that the drier ground had affected the stone−widening the interstice between MHB 122 and the Ptolemaic wall making areas accessible that had not been before. 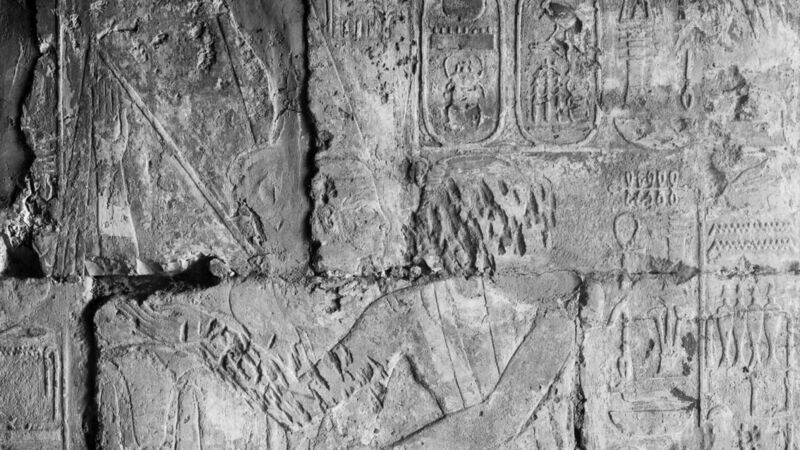 So I foiled the scene again and found more of the lower portions of the king and Amun figures and all that was missing of the inscription across the bottom of the scene. The drawings on foil were drawn onto a new sheet of plastic and checked by epigraphers Ginger Emery and Brett McClain. Now the question was how to accurately transfer this considerable amount of information onto my original hand inked drawing on paper? Chicago House had begun using digital technology by 2004, with Demoticist/artist Tina DiCerbo, who lead the way with her use of the Wacom Intuos3 for her documentation of the ancient graffiti at Medinet Habu. Tina helped me to realize that this would be the perfect opportunity to test how easily a digitally produced drawing could be added to and blend in with my traditional hand ink drawing. Our artists' team made tests of digital pen and brush samples and sizes and decided upon the digital brushes that would replicate our conventional pen lines. The second plastic drawings were scanned, the files copied to a CD, and also printed out on paper at 1:1 for reference. My original drawing was scanned at 1200 dpi and opened in Photoshop. The second plastics drawing file was upscaled to 1200dpi and added as a pencil layer ready for inking to the original drawing. Using Photoshop on my Mac laptop connected to a Wacom Cintiq 22-HD tablet, I positioned the plastics layer to join the new section to the original drawing and inked the new lines using our preset digital brushes. 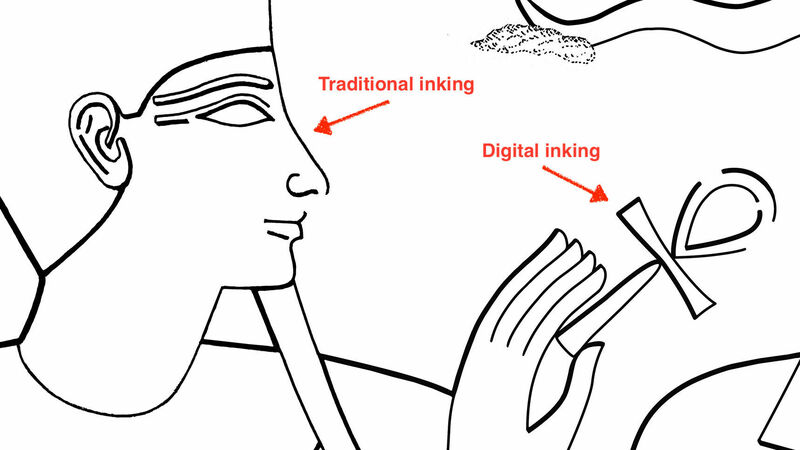 This technology allows us to zoom in on the drawing, clearly showing how rough an ink line drawn on paper can be while the digital lines are always perfectly crisp. Our next question was how would this new hybrid drawing with these two types of lines actually look? In order to answer this, we printed the new drawing out at publication scale (about 12%) in high resolution on photo quality paper and found that not only did it meet our standards for a quality facsimile drawing, the digital and India-inked lines were indistinguishable. This was just the beginning of an exciting new chapter in the history of the Epigraphic Survey. We continue to learn and use new technology with the express interest of recording and documenting the monuments with methods that are precise enough to stand in for the original, and our arsenal of digital tools toward that goal is growing. 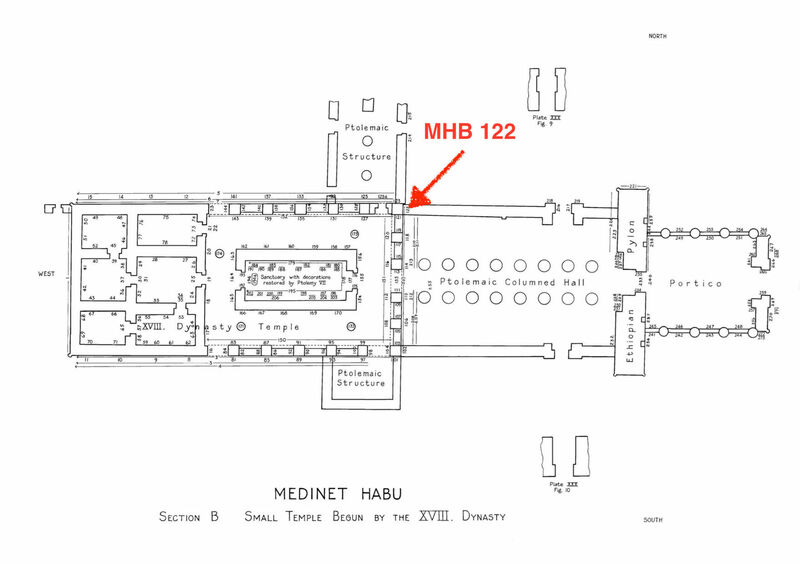 The drawing MHB 122 will appear on Plate 157 in the forthcoming Oriental Institute Publication of this area of the Small Amun Temple titled: Medinet Habu - Volume X. The Eighteenth Dynasty Temple, Part II. The Façade, Pillars, and Architrave Inscriptions of the Thutmoside Peripteros with Translations of Texts, Commentary, and Glossary. You can download our previous publications in PDF format from the Oriental Institute’s publications website. 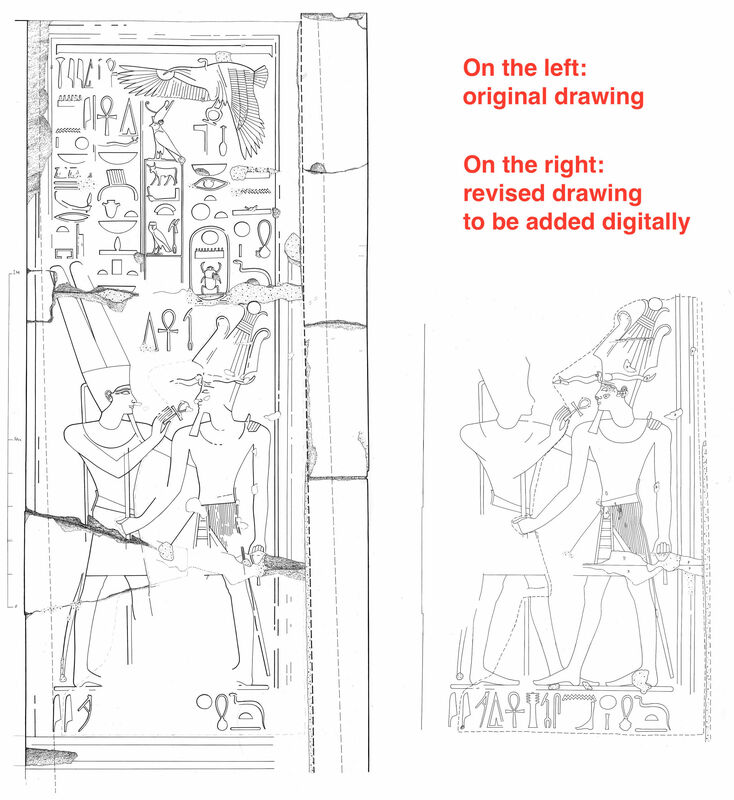 In order to reflect the evolution of computerized recording techniques since the Digital Epigraphy Manual’s release in 2014, the Epigraphic Survey initiated an update of its digital documentation guidelines. The documentation process for the western outer wall of the Medinet Habu Bark Shrine was fairly complicated, although at first sight the project seemed rather straightforward.